We want to sell this product in bulk. The price will be 140.00 INR for a minimum quantity of 400 Nos. Type of Insulators: Type "B"
Our range of Pin Insulators are manufactured as per electrical industry standards to ensure trouble free operation. These are available in both one piece and multi-piece construct, and are less vulnerable to damage and can normally withstand the line voltage for a considerable time without difficulty. Our clients can avail from us these products at most competitive rates. 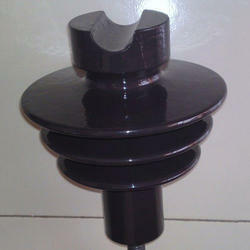 Pin insulators of one piece or multi piece construction are widely used in low cost distribution lines. Multi piece construction makes these insulators less vulnerable to damage. A multi piece insulator can normally withstand the line voltage for a considerable time without difficulty. 11 KV Brown Glazed Porcelain Pin Insulators (CD-230 mm) with cemented lead thimble (without pin) suitable for small steel head G.I Pin minimum failing load 5 KN for normally polluted atmosphere. We offer the best quality of Copper Pin Type Insulated to clients at extremely reasonable prices. It is highly non corrosive. We are manufacturers of Polymer Pin Insulator Bottom Fitting Studs in M16, M20 M24 in different lengths.